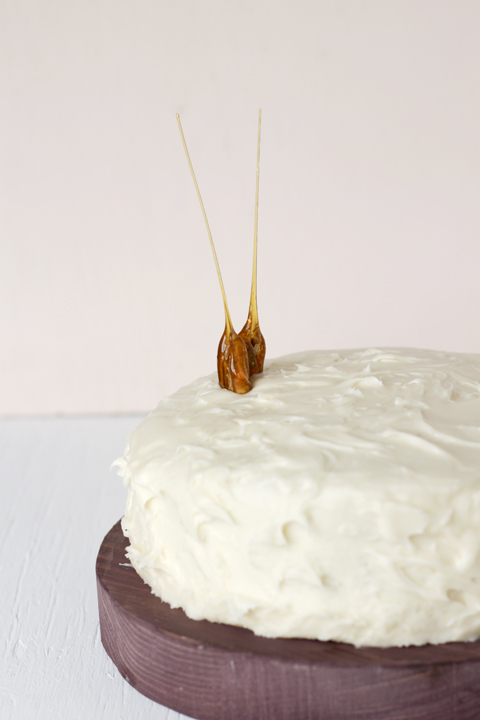 Carrot Cake with Cream Cheese — always with butter. Oh well, late night ramblings, sorry. This carrot cake. My first time making a carrot cake and of course a Martha recipe. This is by far the most moist carrot cake I have ever had. I didn't change her recipe at all, it was perfect. So carroty, that hint of spice, the crunch of the pecans. It was so good. And cream cheese frosting. Such a classic recipe, old fashioned, traditional. But what could be better? It is not fancy or avant garde, but who cares? Classics are always appropriate. So when trying to make a pretty cake, you have to level off the top. And you know the best part of that? You don't have to wait till you finish decorating the whole cake before trying it. You get a sneak peak! What a great breakfast. Yes, my diet is probably horrible. I make so many cakes and dessert, have to drink a whole pot of coffee just to wake me up and eat a probably unhealthy amount of cheese. But I eat those little gummy multi-vitamins and never get sick, so I'll enjoy it while I'm young. Oven 350F. Butter and flour three 9 inch round cake pans. Whisk flour, baking powder, soda, cinnamon, salt, ginger and nutmeg. In a separate bowl beat butter and sugars until pale and fluffy. Add in eggs one at a time. Beat for 3 minutes then add vanilla, water and carrots. Add in flour mixture then pecans. Divide evenly among the three pans and bake for 30 minutes until center is set. Let cool completely. Beat cream cheese and vanilla for 2 minutes until light. Add in butter then gradually add in sugar.